Orange players, led by senior Jack Houston (47), celebrate as they come off the field after Grant Simon booted a 40-yard field goal to give the Pioneers their first lead of Friday’s OCC showdown against host Olentangy. It’s common for rivalry games to have twists and turns, which is exactly what Olentangy Orange football coach Zebb Schroeder told his team in the week leading up to the Olentangy game. And sure enough, the Pioneers battled back from a 21-3 deficit in the second quarter to knock off the rival Braves in a 30-28 thriller Friday night at Olentangy High School. “We didn’t get down early – we kept chipping away,” Schroeder said. Orange got big performances by key players throughout. Senior Garrett Runyon had an interception at the goal line to thwart an Olentangy scoring opportunity in the third quarter. That interception set up the third of Grant Simon’s three field goals – a 40-yarder to give Orange its first lead of the game. He followed with a 60-yard punt return less than a minute into the fourth quarter, which ended up being the difference in the game. Senior quarterback Luke Schmeling started the rally with a 23-yard pass to Jordan Shelton to set up his own 2-yard run on the next play to cut the deficit to 21-10 with 1:10 left before the half. Senior Brian Watson made another big special teams play when he returned a kickoff 37 yards to open the second half. Orange got an extra 15 yards after an Olentangy personal foul penalty. Seemingly on cue, Schmeling found Manny Anderson on a fly route for a 37-yard touchdown to cut the deficit to four just 14 seconds into the third quarter. Olentangy quarterback Riley Bruening connected with Caden Kaiser on a pair of touchdown passes. The first was a 73-yard pass play. Bruening evaded pressure and found Kaiser alone at the Orange 40 and from there, Kaiser went untouched to give Olentangy a 7-0 lead in the first quarter. The two connected again in the fourth quarter on a 6-yard score as Olentangy tried to come back from a nine-point deficit after Runyon’s punt return. Luke Reidel and Ali Iverson had short touchdown runs to help Olentangy build its lead in the first half. Orange’s defense was led by Bryce Houston, who assisted on nine tackles to finish with 8.5 overall. Zach Harrison had 1.5 sacks and it was his hit that forced Bruening’s errant throw intercepted by Runyon. It came down to one thing for Olentangy football coach Mark Solis. “Honestly, our special teams were not good and I am not happy about that,” he said. “Our special teams did not help us. Both teams host league games next week. Olentangy hosts rival Olentangy Liberty and Orange plays Westerville Central. Kick is set for 7 p.m. for both. 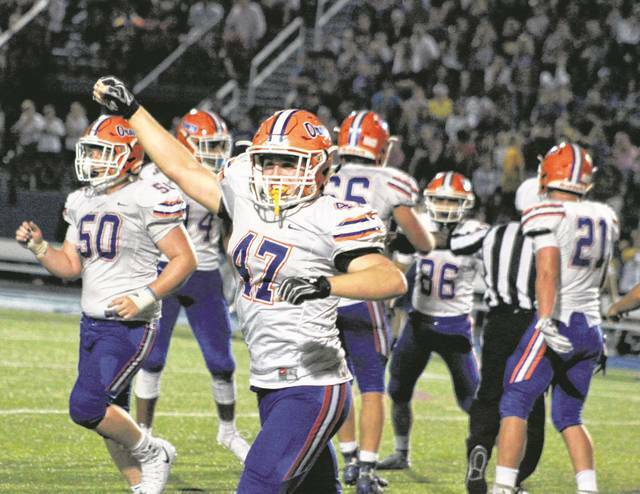 https://www.delgazette.com/wp-content/uploads/sites/40/2017/10/web1_oocelebrate-1.jpgOrange players, led by senior Jack Houston (47), celebrate as they come off the field after Grant Simon booted a 40-yard field goal to give the Pioneers their first lead of Friday’s OCC showdown against host Olentangy.